Have you heard of NEW Simply...Go-Gurt?? New Simply... Go-Gurt is made from simple ingredients moms look for and contains no high fructose corn syrup or artificial colors or flavors. Each convenient portable yogurt tube contains a good source of calcium and vitamin D. Simply stated, Simply... Go-Gurt is a good-for-you, low fat yogurt snack that you can feel good about giving to your kids. New Simply... Go-Gurt is available in two kid-friendly flavors, Strawberry and Mixed Berry. I buy three or four boxes at a time. I keep some in the fridge and some in the freezer, for a frozen yogurt treat!! I even pour them into McKinley's bottle and mix with her milk for a smoothie type treat for her!! Wanna win a Simply...Go-Gurt Prize Pack?? 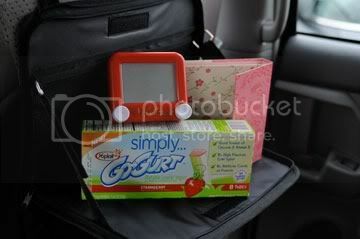 You will win a Go-Gurt "Simplify Your Life" prize pack that includes a pocket Etch a Sketch, weekly planner and a seat back organizer. You'll also receive a coupon for a FREE box of Simply...Go-Gurt! *Share a wholesome snack idea that you give your kiddos. I will draw a winner on Monday, May 17 at 1pm PST. I received this prize pack as a gift from MyBlogSpark. The thoughts and opinions of Go-Gurt are my own. Can't wait to try these!! We eat the cotton candy go-gurts frozen as a treat! Honestly, our favorite wholesome snack is good, old apple slices! Love them! Easy and delicious and nutricious! My kids like my mini vegie platters!!! I always carry a baggie of carrots with us. It's an easy, healthy, non-messy snack! I have to try the frozen go-gurts...yummy! Okay-summer plans are just 2 days away as my little guy keeps reminding me-some local FL traveling-Captiva Island here we come! Pool, beach, FREE movies, and FREE bowling (www.kidsbowlfree.com)! I follow your blog!! :) love your musings! We love taking pretzel rods, dip in peanut butter and "fish" for whole grain "goldfish" snacks!